What primary benefits do the RUBEK Operators offer to the customer? What applications are these operators ideal for? Why should I use the RUBEK Automatic Door Opener instead of an alternative Door Opener? How big are the operators and what modifications can be made to suit different applications? What type of locking features do the RUBEK Operators offer, and how will these features benefit me? Where can I get detailed drawings of the RUBEK operators? Are the RUBEK operators quiet in operation? Do the RUBEK Operators comply with the current Australian Standard? What support and/or assistance do I get when choosing and installing a RUBEK Auto Door Operator? Can the RUBEK range of automatic door operators be interfaced with security? Does the RUBEK range of automatic sliding doors have a fail safe system? And what importance does the 'Fail-safe' facility play? What is unique about the RUBEK range of operators? Does the RUBEK Automatic sliding door range come with battery back up? Will the doors continue to operate when the mains power has failed? How do I select which door operator I need? What type of locking mechanism does the RUBEK range of automatic door operators have? What benefits do Rubek Automatic Door Operators offer the fabricator? The option of same day delivery for emergency orders. 24 Hour Service Hotline and Technical Assistance. Tailored Service programs that won't lock you or your client into expensive contracts. The flexibility to design and manufacture non-standard type door operators custom built to suit individual and project needs. A selection of models to suit the smallest type of door to the largest (heavy) type of sliding doors. Knowing that the ($) dollars stay in W.A. The customer deals DIRECT with the manufacturer for all sales, customized designs and after sales service. Knowing that the products are backed by a local manufacturer. The products are designed in W.A. to meet all Bi-Laws, Australian Standard Codes and C-tick qualifications. New Developments in the main controller offers additional safety features with the door operation. “Open protocol system”, ensuring the end user is not locked into or restricted to one service organization. All RUBEK Auto Door operators are designed to suit all levels of duty from medium traffic through to high density traffic requiring continuous use. Effectively, these operators can be used in most applications for financial institutions, supermarkets, petrol stations, shopping centre’s and other commercial sites requiring security and control of traffic. Please refer to our client list for a selection of possible applications. The RUBEK Automatic Door Operators offer a host of features and benefits. These include a 24 month parts and 12 month labour warranty, user friendly products, advanced controller technology, tailored service programs, programmable safety release and retry in both directions in the event of a jam, easy morning entry/exit operation, ongoing savings on costly maintenance and many others. All RUBEK Auto Door Operators can be designed and manufactured to suit practically any application. Sometime the only access available is an elevator. In the past we have often had to manufacture split beams for office buildings where this was the only option. Intelligent Control of the Electric Lock on both mains and power failure. The benefit to you is that no matter what your circumstances we have a safe and secure solution that will fit you needs. You may download drawing specifications here. If you don’t see what you want, contact us for more information. All the RUBEK operators are quiet in operation. This is achieved through the use of highly durable polychloroprene HTD tooth belts running on heavy duty nylon track wheels. All track wheels are fitted with quality sealed roller bearings for smooth operation and long life. The drive is via a DC motor and gearbox that is ramped up and down to produce a clean smooth operation and avoid excess noise not to mention unnecessary wear and tear. Yes, all of our operators fully comply with the current Australian Standard AS 5007 - 2007. In some areas we exceed compliance to the standard through increased safety measures. The main feature is our new Safety Retry. The door will sense a jam in either direction and automatically stop and gently back up before pausing to try again. The number of retry attempts can be programmed to suit. Free training for installation if required. This involves the training of a nominated person in the commissioning and installation of the RUBEK door operators - this will save you money. Contact us for further details. Ongoing service and technical assistance as required. All RUBEK automatic sliding door operators can be interfaced to access control equipment via our standard inbuilt interface board. Advice should be sought on your specific requirements. The Fail-safe facility allows emergency entry/exit when a power failure (or fire alarm) occurs. The RUBEK operator will fully open the doors and they will stay open until they fire alarm is reset. The door can be closed manually during this time. If the door is in the lock mode, it will remain locked for up to approximately 8 hours under a standard battery back up. Once the battery is depleted the lock will disengage and the door can be opened manually. The unit is fitted with a battery which operates the doors normally the doors normally upon a power failure. Once power is restored, the operator automatically resets to the normal operating condition and recharges the battery. The same applies with regard to the electric lock. The battery will hold the lock closed until power is resumed or battery is depleted. When in the locked state, and with an active fire alarm the doors will still trigger a Fail Safe and open fully until they are reset. Egress is always available via the exit button. Yes, battery back up is supplied as standard with all RUBEK automatic sliding doors. Our new advanced controller will power a standard set of doors for 2000 operations from battery in the event of a power failure. In lock mode a standard battery will hold the door locked for approximately 8 hours. RUBEK Industries can build you a new operator usually with-in 24 hours. We offer as standard 24 hour 7 days per week support for metro WA and full regional coverage. Safety Panic Switch for emergency closure. Configurable Safety Retry in both directions in the event of a door jam. All Rubek automatic door operators will continue to function as normal using the internal rechargeable battery. Once this battery is depleted the door will stop. When power resumes the door will return to mains power and start to recharge the battery. 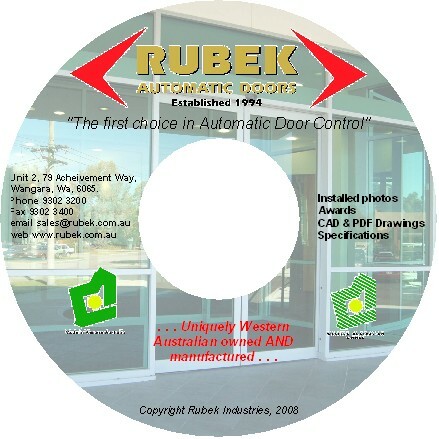 All RUBEK automatic sliding door operators comply with current Australian Building Codes and Standards. We recommend you call us on this one. Rubek Industries has 13 years of experience in selecting the right operator for each application. We know our products best and just what questions to ask to ensure your project is a success. All RUBEK door operators have the option of installing an electric lock directly on the motor. When engaged this lock makes these operators the perfect choice for applications requiring a higher degree of security.